Rest in peace, sweet girlie. We love you. Our sweet old girlie enjoyed her last treat today. Four sausages, at last count. She died like she lived – well fed and well loved. 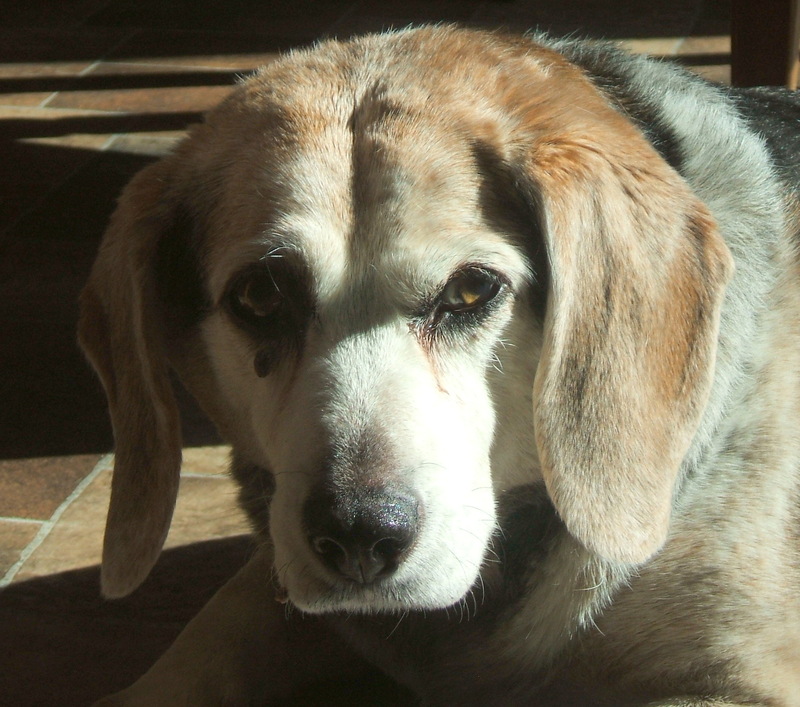 She has gone to join all of the other beagles in heaven, where the mountains of meat loom large and the bunnies and deer are free for the chasin’. Maxie gave us many, many good years and despite ailing health over the past few, she managed to secure herself a place in our hearts and minds forever. Despite rumours to the contrary, I do not have a direct line to the big guy. But, if I did, I would be placing a call today and it would go something like this. Operator: Heaven’s Gate. How may I direct your call? Me: Hi, may I speak to St. Francis of Assisi, please? You know, the Patron Saint of Animals guy? Operator: Uhh…yes, I know who you mean. One moment, please. (pause) I believe he’s in the field throwing sticks, but I’ll find him for you. Me: Hello, Saint, sir. Sorry to bother you. But my dog Maxie is on her way to your place and I just wanted to tell you a few things about her before she arrives. Me: I’ve made a list of reasons why you should let her in. Can I read it to you? Seriously…look at that face. Have you ever seen a cuter face in your whole life? Maxie could put a smile on our faces when nothing else could. My kids have come home from school angry, frustrated and in tears and immediately gone to the dog for a hug. She always responded by licking away their tears and reminding them that there was something else they could be doing, ie. getting her a treat. Maxie smelled like an angel…of course, that was only just after a bath. But even her stinkiness was part of her charm. She was the least fussy eater I have ever known. She ate everything from fresh baked donuts to dirty old lobster shells. Eating was both her job and her hobby. She taught my children how to love unconditionally. Even when she peed on their beds, ripped open their garbage, and ate their birthday cakes, they always forgave her. She taught us that beauty comes in all shapes and sizes and colours…and species…and breeds. Maxie helped the local wildlife stay fit and healthy. The deer and the rabbits in the woods around our house got a regular workout when she was still able to run. One sniff and the howling would begin. If we opened the door (or she managed to push it open by throwing her substantial girth into it) she’d be off like a shot. In the end, she taught us, To everything there is a season. Translation? Eventually, we all have to say goodbye. Finally, not to appear biased or anything, but I’m pretty sure she was the best dog in the whole wide world. Me: So, what do you think St. Francis? Is that enough? Can you open the pearly gates and let my sweet girl into the land of unlimited bacon? St. F: (chuckling) I’ve been trying to tell you that she’s already here. Who do you think I was throwing sticks for? Seriously…was there ever any doubt? Previous postRehtaeh Parsons – Do her alleged “rapists” deserve our open hearts and minds? Awww. I cried more than a “little” tear today. But it was so peaceful. Best. dog. ever. That was a lovely and loving tribute. Maxie was a wonderful dog. I was thinking of you today! It is so awful even if it was time. Best wishes. The build up was the worst. When she finally went, it was very peaceful. Thank you for thinking of me. We are just a week apart! And yes I agree the build up was dreadful. Mind you a week later I still keep forgetting she is gone. Still as your post shows it was great while it lasted. I have a feeling it will take a long time before I stop opening the front door expecting her to be sitting at the top of the stairs. It will take time I’m sure. I loved hearing your tribute to Maxie! She was obviously a well-loved dog and I know you will all miss her terribly. You can have the comfort of knowing she would have known the adoration was mutual! Thank you, Janice. She was the cutest little doggy ever and I know she knew we loved her lots. I only met Maxie and her booties a couple times, but this tribute captures her perfectly 🙂 She graciously accepted the Christmas snacks I snuck her when I was too sick to ear them myself! Thank you Dr. Steph. Maxie was always very happy to accept Christmas treats. We were very lucky to have our very own family vet take care of her in her final moments. Your mom has been a very dear friend to me during all this. Never! You are officially CW in this house. For those who don’t know the story – I couldn’t refer to my friend Cathy by name because Maxie would go wild thinking it was time for a walk. We used to have to call her CW. Oh K.B. All of our animals were so very special, weren’t they? I hope they are all having a great time. It is always difficult to say goodbye to family members. It sounds like he had a wonderful life with you and I’m sure he will be waiting for you. I wish I had comforting words for you and your family, but just know there are others who do understand. I am so sorry for your loss—it is heatbreaking. I had to let go of my (only) dog, Maxine, 14 years ago and I still think of her quite a bit. I love your tribute though and may Maxie enjoy those sticks and lots of bacon treats. That Maxie is all that and more. She’s moved in like she owned the place, in a humble quiet way. . We’re having a grand time with Saint F and even pretend to listen when he gets all holy art thou and stuff. ‘There is no great change, just small moves with great love’ Mother T.
Thank you. Hug your Boxer Angel tight. They are gift to us for only a short time. I think St. Francis must have the best gig going. That’s the one I’ m applying for when I get there. We were all very sad (even Rocky held his head). We remembered a few of the more mememorable moments and know she could not have had a better nine years with any other family! Thank you, Fraser Family. You were great friends to Maxie (not you, Rocky…you really should have shared more of your food…hang your head in shame…just kidding!!! We love Rocky Beagle). We will never forget the story of Brian driving to the shelter to rescue her when she escaped from your babysitting care. It was like the Amazing Race…Brian racing to get her back before we returned home from vacation. Priceless. Thank you. She was a good dog and a good friend. I’m sorry for your loss, she looks so sweet. 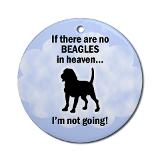 As a dog lover and beagle owner, this made me tear up! Very well written tribute. Thanks Curly Carly. I know all dogs get into your heart but beagles are just so sweet. Great tribute to your little buddy. My most sincere condolences! I am facing that day soon with my buddy Kato and the thought of losing him brings me to tears; God help me when the day comes. Oh dang! My eyes are leaking again! We love them so much so it’s always hard to say goodbye. Thanks, Mitch. So sorry to hear about Ann’s parent’s dog. How kind of you to take the dog in for them. Kevin’s sister (a vet) actually came to the house and did it here for us. It was sad but it was so nice for the dog to be in her own home with all of us around her.